The following is a summary of my two week trip to Japan. I flew into Narita Airport outside of Tokyo, and then spent 6 days in Tokyo, 4 days in Kyoto, a day each in Nagoya, Osaka and Hiroshima. I’ll offer some specific impressions and advice on each city, and then some general comments on travelling in Japan. But first a quick note, that I use the incorrect but easy to remember currency exchange rate of ¥100 being equal to $US 1. It’s actually more like ¥120 being equal to $US 1, but math is much easier when you use round numbers. In Tokyo, I mostly just wandered around and saw the city. It’s an amazingly large place and always crowded, but it can be a lot of fun. I was staying in Ginza, which is a high-end shopping district to the south-east of Tokyo train station, but I don’t think it really matters where you stay as all areas are pretty accessible by Tokyo metro. In a big city, it’s always a good idea to get yourself up high to get a view of the place. The Tokyo Tower (Eiffel tower look-a-like) or Tokyo City View, both close to the Akasaka / Roppongi area both offer views, but both cost money. 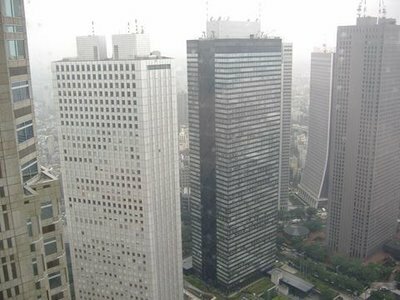 Instead, head to the Municipal Building to the west of Shinjuku station, where you can get up high and get a view of Tokyo for no cost. If you’re lucky, you might be able to see Mount Fuji, though I never did due to either overcast skies or hazy smog. 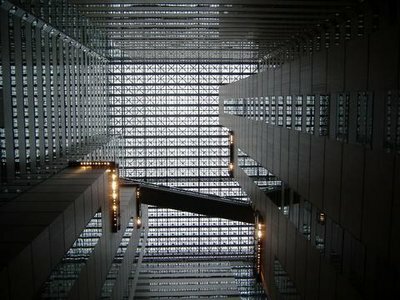 Also to the west of Shinjuku is the Shinjuku NS building with it’s amazing 30 story atrium and the Park Hyatt hotel, which is a good place to go for some expensive drinks with a great view. It’s the same hotel featured in Sofia Coppola’s Lost in Translation. To the east of Shinjuku is some great discount shopping, as well as the red light district and the area called the Golden Gai. The Golden Gai is a number of really small alleys filled with bars that many Japanese hit after work. However, a number of places are private clubs or don’t allow foreigners inside. Those that do allow foreigners usually charge a cover charge and pricey drinks. It’s interesting to see, but may not be a great place to drink every night. Kyoto’s main attraction for tourists is the large number of temples, shrines and castles that are there. There are over 2,000 sites, and many of them are UNESCO heritage sites. The crowds can be pretty thick, though. The best bet is to arrive at places right at the opening hour, and get ahead of the bus tourists. Two of my favorites were Nijo Castle and Shoren-In temple. I arrive right at the 9am opening of Nijo Castle, and am able to walk quickly past the tour groups on the squeaking nightingale floors (ancient alarm system – all the floors in the castle squeak to alert everyone of intruders) and soon am ahead of them and have the place to myself. It has a beautiful large garden with old stone walls, and is very peaceful. I arrive at Shoren-in right at 9am, it’s opening time. I think this is the secret, arrive early. I walk in, and I have the place to myself. 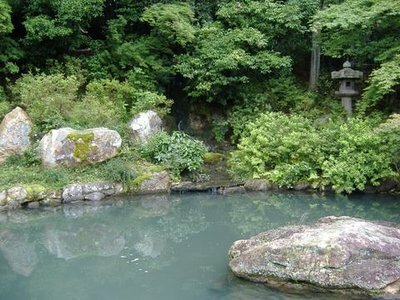 I kneel on the tatami mat floor and contemplate the waterfall and beautiful gardens outside. Shoren-in might not be the most beautiful of all the temples in Kyoto, but it is only as I am alone, with no sounds but the sounds call of the birds, the splash of the waterfall and the rustle of the wind through the bamboo that one gets a true appreciation of the peace of mind that meditating at these temples can bring. Of course, by posting this on the internet, I may have destroyed that peace for future generations of tourists. Most temples charge an admission, usually between ¥500 and ¥1000. I enjoyed the Umekoji Steam Locamotive Museum. Umekoji is an old station house that has been turned into a museum of steam powered rail. They have a bunch of old engines that you can look in, some interactive exhibits on how steam engines worked, and a few model train sets. But the big attraction is the chance to ride for 1 km on a steam train (500 m down a spur line and then 500 m back). Afterwards, they pull the engine onto the working turntable, turn it around and fuel it up, then again onto the turntable to put it into the roundhouse for the night. Entrance was ¥400, and the ride on the steam engine was another ¥200. I also, I will point out, watched the World Cup final in Kyoto at 3 in the morning at a bar called The Hub near the area called Pontocho. Besides for mentioning this because the Pontocho is a good place to find food and drinks, I wanted to say that I won my world cup pool. I know futbol! I spent one day in Nagoya, and during the day had one task in mind - the Nagoya Basho Sumo Tournament at the Aichi Prefecture Gymnasium. This sumo tourney takes place for 3 weeks in July (first Sunday to the third Sunday). Tickets are ¥2700 ($US 27), and can be bought at the door. If you go during the week in the first couple weeks of the tourney, you should be able to get tickets without any issues. The last week and the weekends are pretty busy. The 2700 Yen tickets allow you general admission, which means you can sit anywhere someone isn’t sitting. This allows you to get right up close and see the action, plus get some great pictures. The stadium was a pretty typical stadium, with rows of seats around a center area. But for the sumo, most of the seats had been folded down, and boards with purple pillows were laid on top of the seats, allowing the fans to sit cross legged on the floor while watching the action. The ring itself is a square raised a few feet off the floor. On the ring is a dirt covering with a circular field created using a rope. It is in this circular part that the wrestlers do their thing. Outside the ring, on the floor, sit 5 judges in black robes. Two wrestlers sit on either side of two of the 5 judges (the next two bouts). First, a guy comes out, opens a small fan, and sings to both the wrestlers, turning from one side to the other side half way through his short song. The wrestlers then stand and enter the ring, where they proceed to slap themselves and raise and lower their legs. The wrestlers than stand in the middle of the ring, where they face each other. The guy who was singing picks up a broom and starts sweeping around the edge of the ring, removing dirt from the rope. A referee addresses both the wrestlers by yelling at them. Then the match starts. I think it starts when both wrestlers place their hands on the floor, getting into a 3 point stance, but I’m not certain on that point. The wrestling consists of two large men slapping each other, occasionally pulling the hair of the other guy and attempting to grab their opponent by his underwear. At some point, one guy manages to throw the other guy down or push him out of the ring. At that point both wrestlers return to the ring, stand facing each other, and then the referee yells at one of them, declaring him the winner. The whole thing takes maybe 5 minutes from start to finish, with the bout itself taking maybe 1 minute total. It starts all over again then. I watched the sumo for about 3 hours, but never really “got” it. I think, much like ice hockey to a person from Mississippi, unless you’ve grown up with it, you probably won’t understand it. Went to Osaka for the baseball game! I watched the Hanshin Tigers of Osaka take on the Hiroshima Toyo Carp in Koshien Stadium. Koshien Stadium is the oldest baseball park in Japan, built in 1924 to be host for the high school baseball championships, it has been home to the Tigers since 1936. The stadium has a very old time feel, with ivy climbing the walls outside and a real grass field inside (most ball parks in Japan have astro-turf). It seats 53,000 people, and the field itself is circular, giving a huge foul area. It was interesting to see the game, because while the action on the field is as American and baseball and apple pie, the fans are not. They are much more European soccer fan like, in that they have chants and songs and flags and are pretty much active the entire game. Outfield tickets to Koshien Stadium cost me ¥1700 (US$ 17). To get to the stadium, take the Hanshin line from Umeda station and exit at Koshien Station. Return tickets for the train cost around $US 5. Tickets for baseball games are hard to get overseas, but shouldn’t be a problem to get once in Japan. I would recommend going and getting tickets a few days before the game to ensure you get a seat. The two biggest teams are the Osaka Hanshin Tigers and the team from Tokyo, the Yomiuri Giants, who play in the Tokyo Dome. Tickets can be purchased for a the games from a ticket vendor, ask at the TIC (Tourist Information Center (see below)) where the nearest ticket vendor is. They’ll probably be one close to the major train stations. I stayed at the hotel booked on the travellerspoint site for ¥2100 ($US 21) a night, which was about the best accommodation deal I got. However, the area was full of hotels similarly priced, so you should be able to just show up and find a place if you want (the only place I found in Japan where I would suggest that, by the way – see more in accommodation below). The area was a bit out, but still right by the subway, and there were a number of hotels in the area. Rooms were small, but comfortable and clean. The area is right by Dobutsu Enmae station on both the Mido Suji line and the Sakai Suji lines. Heading to the north-east there are a number of places in a quiet area from around ¥2100. To the south-east, there were a number of places from between ¥1300 to ¥1900, but the area was a touch shadier. I just popped into Hiroshima for the day after seeing the Hiroshima Toyo Carp fans at the baseball game the day before. Obviously the A-bomb Dome and associated attractions are the big draw in the area, but Hiroshima was interesting for me to see because of the rest of the city that had built up around the A-bomb site. I knew little about Hiroshima before arriving, and must admit that I was shocked to find such a vibrant city built up around the site of the first atomic bomb explosion. Hiroshima reminded me a lot of the other cities in Japan like Nagoya or Osaka, and that’s what was amazing about it, that it’s history was not it’s present. Interestingly, also, is that Hiroshima was the place I saw the most white people my entire trip. I wonder if it’s morbid fascination with destruction, or nuclear guilt? I really enjoyed Japan, and could have done a lot more travel there. It’s a great location to see especially if you are a fan of big cities, as Tokyo is the biggest. In general, I was surprised by both how easy and how difficult Japan was to travel in. For the easy part, the trains all run on time and have English announcements (even the subways, trams and buses), and are frequent and clean. There is no haggling and most every place has a cash register so you can easily see what you owe. There’s no tipping or additional tax, so prices you see are prices you pay (some places, mostly upper crust places or tourist sites charged a service charge, but it was usually pretty minimal). And many places either had English menus or picture menus, making it easy to order. In other respects, though, I found it hard to travel around. In fact, someone asked me how I compared travelling in Japan to travel in China or South America, and I said that I felt Japan was harder than either of those places. There were very few people that spoke English, and I often felt myself really struggling to communicate or understand what was going on. In China or South America, I often felt that I understood what was happening, even if I couldn’t understand what was being said. They were, in a sense, simple, in that a meal was a meal and meeting someone was meeting someone. In Japan, though, I often felt like what was occurring before my eyes was part of an elaborate ritual that I didn’t understand at all. Even though Japan is an Asian country with few English speakers, I was really surprised by this. I chalk this up to two things. The first is that Japan is a G8 country with a long history of ties to North America, and so I expected that it would be easy to travel in. This is further backed up by the fact that many of the things you see in Japan are very familiar to the North American or European – it’s got a large middle class and the infrastructure of the country is very similar to us. The roads are in good shape, and you see many of the same cars as home. People have similar technology and dress the same, and there is a large middle class. There’s even baseball on the TV! But if you dig a little deeper, there are differences in those small things. This can be confusing, because you expect when you see something that is familiar, it’ll be a certain way, but then you find it to be different. As an example, you see ATMs everywhere, and Japanese people using their ATM and credit cards to pay for things. However, most of these systems aren’t hooked up to the international networks, and so the ATM and credit cards from home won’t work in most places. So the first point is really that I expected it to be easy, but when I encountered small unexpected problems, they seemed more distressing then if travelling in South America or China, where you would expect things not to work (like your ATM card). Secondly, though, I think there is some truth to it really being harder in some respects, because in a lot of ways Japan doesn’t need internal tourists as much as China or South America does. In those places, the US dollars you are spending are a big part of the economy, so there is a certain amount of infrastructure that is built up to support the international tourist. This even filters down to the backpacker spending level. In Japan, however, they have a robust economy that doesn’t rely heavily on the North American tourist dollar, and so there isn’t the same infrastructure readily available to support the North American backpacker. The above being said about lack of infrastructure, there is one key thing that every city had that was a godsend for the tourist, and that is the Tourist Information Center (TIC). In most every train station of some size, there will be a Tourist Information Center. Here you will find English speaking staff that can assist you in planning your travels, including booking accommodation. The TICs are hooked into the Welcome Inn Reservation Center, which allows booking of a number of properties across Japan. They can provide directions, and assist me in figuring out how to purchase baseball tickets. If for no other reason, upon arrival in a new city you should pop in the TIC to pick up the free tourist map of the city. If you can’t find the TIC (sometimes they are hard to find unless you know what you are looking for), go to the nearest international hotel and get a tourist map from the concierge. As stated above, English is not widely spoken. It is, however, very widely used on signs throughout the country, and many menus and restaurants will have English / Japanese menus (where you can point at what you want, and the waiter can read the Japanese translation). The TICs will have English speakers, and can help with translations if needed. Also, some of the hotels I stayed at had free access to an English translation service via phone. The Japanese use the Yen (¥). Currently, $US 1 will buy about ¥120, though I always just used the easy conversion rate of $US 1 = ¥100. There are both notes and coins. Most likely, you’ll see 1000, 5000 and 10000 yen notes. ATMs (see below), mostly give out 10000 yen notes. Coins come in denominations of 500, 100, 50, 10, 5 and 1. All notes and coins are marked with the denomination of the bill or coin with the exception of the 5 Yen coin, which is bronze with a hole in the middle. ATMs are plentiful, but most are not hooked up to the International networks, meaning that you can’t get money. For international travellers, the best choice is to find an international bank. Citibank was the most common. Also, the postal service has ATMs that are hooked into the international network, though those are only open during the postal office hours. Look for ATMs with English instructions, or ask at the TIC or your hotel where the nearest international ATM is. Credit cards are not widely used, and even most hotels expect cash payments. The best deal in Japanese travel is the JR Rail pass. The JR rail pass allows unlimited travel on any Japan Rail service for a period of time (either 7, 14 or 21 day). It is only available to international travellers on a tourist visa, and must be purchased overseas. You will be given an exchange order, and upon arrival in Japan, the exchange order can be exchanged for a JR Pass (once they see your passport and visa type). The 7 day pass is ¥28300 (US$ 280). Even if you are just planning on travelling between Tokyo and Kyoto (the two most popular destinations in Japan), the pass will almost be paid off. Any additional side trips and the pass is paid for. There are a number of JR rail services. Of most use to the first time, short term visitor to Japan will be the Tokaido Shinkansen service, which runs between Tokyo and Osaka (including stops at Kyoto). The trains are fast and comfortable, and run very frequently. I never bothered with advanced reservations, and the longest I had to wait was 20 minutes for a departure. Once in town, most of the cities I went to had subways, except Hiroshima that had a tram system. For subways, the price of your ride depends on how far you are going. There will be a map indicating the cost from the current station to all the stations in the system. Carry your city map with you, as it includes an English subway map and could come in handy if the station’s map isn’t in English. When you enter the subway, you put your ticket in the gate and retrieve it. When you exit the subway at your destination, the gate will accept your ticket and keep it. Don’t worry if you didn’t put enough on your ticket. All subway exits will have a place to add additional value to your ticket so you can exit. There are day passes and stored value cards that could be of value if you are travelling a lot on the subways. I took the bus in Kyoto and the tram in Hiroshima, and they had a similar system. You purchase a ticket and get on the bus or tram. Upon exiting, you present your ticket at a machine by the driver and exit. This is most likely the highest cost of travelling in Japan. In Tokyo, I mostly stayed at the Marriott Renaissance Ginza Tobu Hotel using my Marriott Rewards points for a “free stay.” My free stay, however, included a ¥2500 a day “service charge”, meaning that I was still spending $US 25 a night for the hotel. But that was a pretty good deal considering how much the hotel usually charges for a night (around $US 400 and more). For that price, however, I wouldn’t stay there. But that’s the average prices for international hotels in Tokyo. Accommodation doesn’t have to be so bad, however. You do need, though, to put some thought into it and think ahead. Just showing up in a place and walking up to a hotel isn’t a great approach. Firstly, not all places accept foreigners. Secondly, it’s hard to know what the rates for hotels will be judging by their looks. I just showed up at a hotel in Tokyo, and ended up spending ¥18000 (US$ 180) a night. To avoid that, book ahead. You don’t need to book to far in advance (even day before or day of), but it’ll help. Use multiple sources to book ahead. The TIC can book places using the Welcome Inn Reservation Center, and got me a great deal on a place in Kyoto for ¥4000 (US$ 40) that usually charges ¥7000 a night. Also, I found a place on the travellerspoint site for ¥2100 ($US 21) a night. And, of course, there’s always the fall back of the capsule hotel, which run around ¥2500 - ¥4000 depending on the location (not an option for the female backpackers, though, as women are not allowed). In Kyoto, I stayed at a Ryokan called the Hotel Nishiyama (¥4000 (US$ 40)) that included a private washroom and bath. A Ryokan is a traditional Japanese style inn, where you will find mat floors with a futon and sliding paper doors (though the door to the external hall is a thick metal secure door), and will include a public bath. In Nagoya, I tried the capsule hotel. There are a number of capsule hotels throughout Japan, and basically have the same structure. The capsule is about 2 meters deep and 1 meter by 1 meter high and wide, just enough to get into and roll around comfortably. The capsule contains a small TV, a radio, an alarm clock and a lamp, all built into the surrounding walls and coated in plastic, making it feel like it could all just be hosed down for cleaning. Basically, the capsule hotel is like a hostel dorm, but for business men in Japan. You share a public bath and will get a small locker, but they will hold a large bag behind the desk. The capsule provides all toiletries needed, including toothbrush and paste, shaver and shaving cream and towels and PJs (actually, most of the hotels provided all these things). As I said above, though, no women are allowed at the majority of capsule hotels. 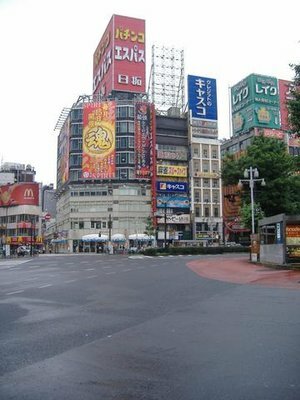 In Osaka, I stayed at the Hotel Mikado, near the Dobutsu En Mae station for ¥2100 (US$21). There are a number of hotels in the area with similar prices. You get a small room with a TV, and access to the public bath and shower. Women are allowed, and there are separate men’s and women’s hours on the public bath. The shower is open 24 hours a day, with a limit of one person per time in the shower. Food in Japan is great, and needn’t be expensive. Though you can easily run up tabs of ¥10000 (US$ 100) per person in the nicer restaurants, it’s possible to eat really well for a decent price. I found many places offering really good meals with lots of variety for ¥500 and ¥1000 ($US 5 - $US 10) a meal. In fact, many of these meals were large enough that you could get away with only two meals a day. English isn’t widely spoken, so look for places with English menus or picture menus. Failing that, you can always point. The fish market is a great place to get a cheap breakfast. In most towns there will be a fish market, and as the workers are winding up their day as you’re getting started, there’s a ton of great sushi and soba noodle places to eat at. For lunch, I’d often just grab something from a variety store. Most of them will have a large selection of prepared meals, from sandwiches (egg salad, tuna, ham and cheese and vegetable are usually all available) to meat skewers and cold noodle dishes. At dinner, there are lots of great places around the train stations. You need to try eating at least one night at a yakitori restaurant, where you pull up to a counter and order small dishes and big beers. For the single traveller, eating in Japan is great, because almost all places have a counter for the single dinner to sit, avoiding the usual embarrassment of taking up a whole table for one person. Also, there is a strong possibility that as you are sitting at the counter, you’ll get invited to join in the conversation, meal and drinks of other parties. Don’t be surprised if they end up paying for your meal, it’s Japanese tradition. Like accommodation and unlike food, finding cheap drinks in Japan is tough! There are places that charge as little as ¥300 for a drink, but many places you’ll be spending ¥600 - ¥1000 for a pint of beer. I found I really had to look around to find places that were both cheap to drink and open to foreigners. The best thing I can suggest is to fall back on that traditional college trick of “priming” before going out. Go to the convenience store, but a couple 500ml cans of Sapporo Draft One and drink before going out. This will get you primed up for a night out, but easily save you at least ¥1000. If you are in Japan in the summer, for an interesting experience, you need to check out the “beer gardens” that department stores set up on their roof tops. (An English language paper I was reading was making fun of the beer garden in Japan by questioning why putting a keg on a cement surface constituted a garden). They often have “all you can drink and eat” specials (timed for 60 or 90 minutes), and provide you with good beer and a do it yourself grill to cook your food. I’ve already mentioned the sumo and baseball. In addition, I would suggest going to see one of the “amusement centers” that are very prevalent in every city. These are a combination of video arcade, bowling alley, bar, restaurant and casino. They offer everything from video games to slot machines to Pachinko machines. Pachinko is a form of Japanese gambling where you turn a little silver knob, and that shoots BBs out of the top of the machine. If you turn the knob too far to the right, the BBs run all the way down and out the one side. If you don't turn far enough, the BBs don't make it to the center of the machine, and fall down the other. If you hold the knob just right, though, the BBs will bounce off some nails, and if you are lucky, fall into a small slot where you will win 5 more BBs. If you win, I take your BBs and exchange them for money outside of the Pachinko hall (due to gambling restrictions). The other experience is the onsen, or public bath. Most of the hotels have these, or you can head up into the central part of the country where mountain hot springs provide a natural version of this. One enters the onsen, gets naked and then squats on a stool. They soap up and rinse off using a bucket of water and a washcloth, and then, now clean, they enter the bath itself, of really hot water. It is a relaxing and liberating experience, and apparently one of the few places in Japanese society where you are free of rules, as long, of course, as you follow a set of rules in expressing your liberation. It’s basically a unisex public hottub. Thanks Greg, Im a single woman and leave for Japan next week for a week, Im travelling around the world and am getting really nervous about Japan but I feel slightly better now!